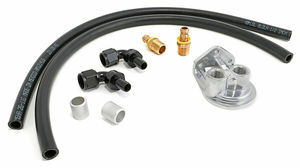 These oil filter relocation systems are specifically for use with aftermarket LS engine oil pans that have a pair of -10AN male fittings built into the pan design where the factory oil filter is normally installed. 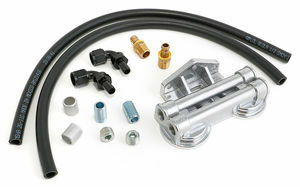 Unlike Trans-Dapt's other oil filter relocation kits, these oil filter relocation systems do not include a filter bypass adapter. 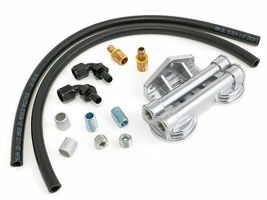 Instead, they include a pair of 90º aluminum -10AN female fittings that screw directly to the oil pan's inlet and outlet fittings. 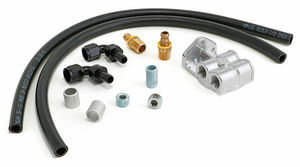 The right angle design of the fittings runs the lines parallel with the engine block for a compact installation. Three different kit are available, each with a distinct remote filter base. Choose between our double filter design to double the filter surface area, or a single remote base with either vertical or horizontal ports.